Really, it is just an informal gathering: Neighbours getting together for a chin-wag over a drink and a nibble from the barbecue. No need to put on the glad-rags. Just a little over 2 hours until (5.30pm) we get things started on the 9th floor roof terrace of Gaumont Tower. Bring a bottle of your favourite tipple and something to throw on the bbq (and/or perhaps something to share). 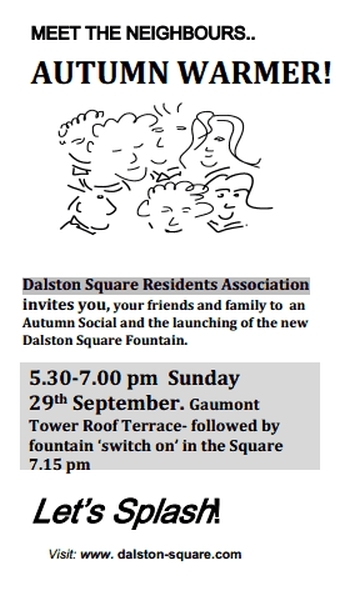 Then at 7.00pm we will all head down into the Square and fire up the fountain (figuratively speaking of course). Bring your friends, bring your family, Let’s Splash! Hi all. 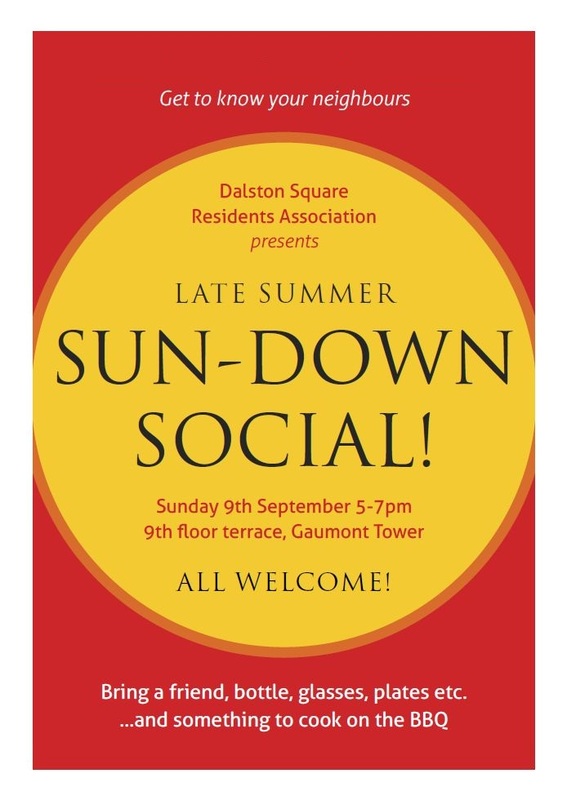 Just a final reminder that this coming Sunday will see the DSRA’s late summer BBQ event on the 9th floor roof terrace of Gaumont Tower. And just to mention that although it is advertised as running from 5-7pm, no-one will be shooed away at 7pm: With the Paralympic closing ceremony due to kick-off at 9pm that evening, complete with fireworks, it should be a fun evening (even the weather forecast is currently favourable). Be there, or be (Dalston) Square! 🙄 Click the thumbnail below for the full-size poster.